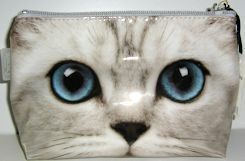 This silver kitty face appears on both sides of this medium cosmetic bag. The bag is 7 1/2" wide x 5" high x 2 3/4" deep at the base. Moisture proof lining and 1 inside pocket. Zippered top. Purchased at a sample sale.